As the world’s leading and most diverse derivatives marketplace, CME Group is where the world comes to manage risk. Comprised of four exchanges – CME, CBOT, NYMEX, and COMEX – CME Group provides a broad range of global benchmark products across all major asset classes, helping businesses everywhere mitigate the myriad of risks they face in today’s uncertain global economy. 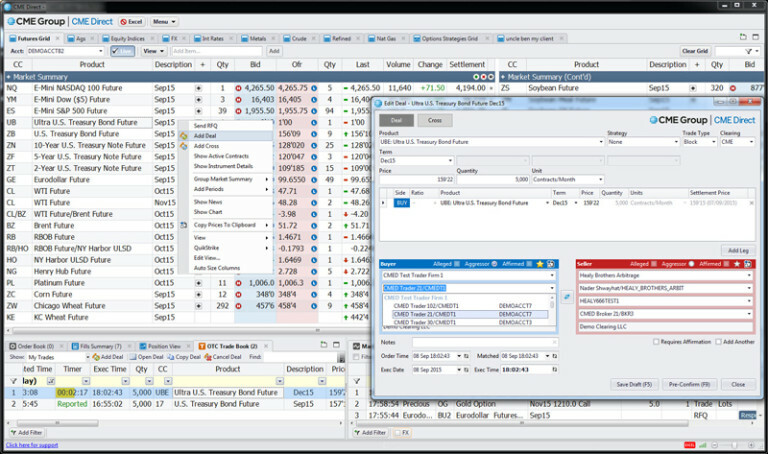 CME Direct is a highly-configurable trading front end for CME Group markets that offers a complete suite of solutions across the trading lifecycle. 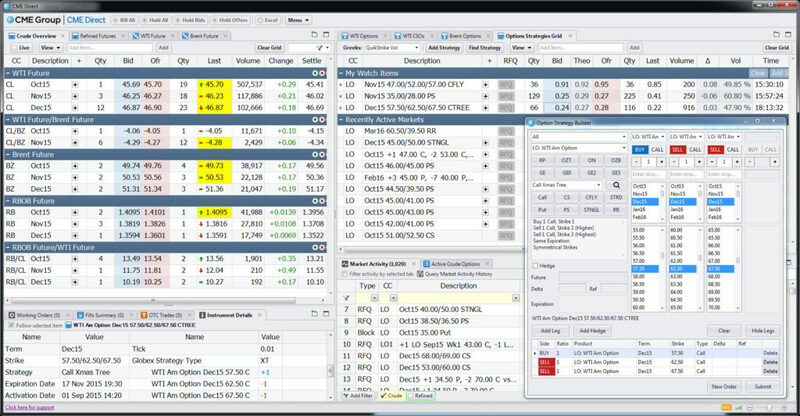 Access listed and Block markets all on one screen, and execute custom options strategies with speed and agility using our enhanced options functionality. 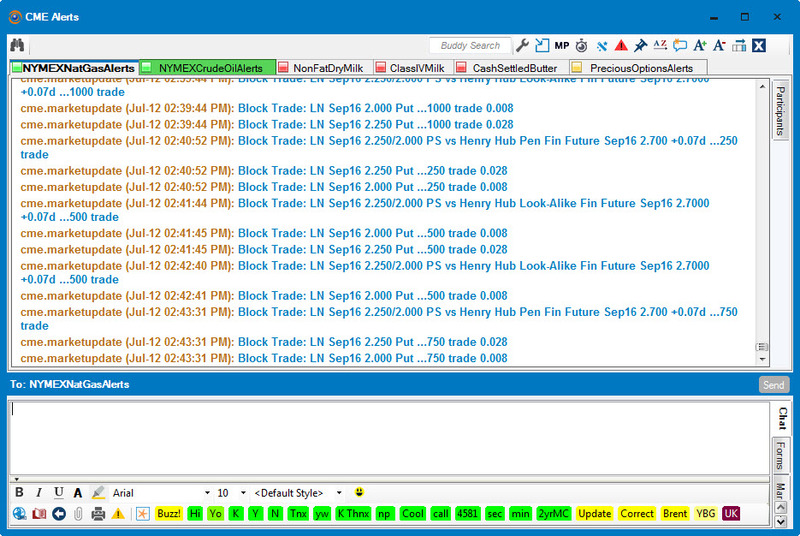 Access CME Group electronic futures, options, and OTC markets – all on one screen. Choose the best way to execute trades either online or through a voice broker. View all CME Group futures on one screen to execute on a customer’s behalf, or use CME Direct to process voice-negotiated blocks instantly. CME Direct Messenger is an advanced instant messaging platform that integrates seamlessly with CME Direct. Delivered securely across the Internet, CME Direct is a highly-configurable trading front end for CME Group markets that offers a complete suite of solutions across the trading lifecycle. CME Direct offers integrated deal capture for blocks and complex strategies with streamlined deal tickets optimized for recently used customer accounts and trades. CME Direct Messenger is an advanced instant messaging platform designed specifically for commodity traders and brokers. By combining intelligent parsing technology, a highly-collaborative environment, a secure network and a seamless integration with CME Direct, CME Direct Messenger helps you trade more efficiently. Download CME Direct Messenger v8.3, and become a part of a secure, private network that connects all users. Our network chat rooms are highly flexible, secure and fully compliant, so you can configure them to meet your individual needs and rest assured that you are complying with the most rigorous data control policies. Use them to link communication across your desk, or communicate and share between desks at different firms. Leveraging world-class commodity market parsing engines, you can value complex options strategies in seconds using our bundled analytics service or your proprietary models. Separate markets from conversations, convert text to data and capture and use critical market information instantly – all integrated into one view. Use our Monitors and Message Prioritizer to alert you to important symbols, products, or strategies, while ignoring time-consuming distractions. Configure your workstation using multiple views, fonts, and priorities for maximum efficiency and usability. Save time to enter complex deals subject to tight reporting deadlines by using CME Direct Messenger’s Click and Clear functionality. Click and Clear reduces errors and speeds the submission of trades by 20 to 30 seconds per trade ensuring deals are sent immediately and are fully compliant. CME Direct must be installed and running to use Click and Clear. CME Messenger integrates seamlessly with all major message compliance and archival applications to ensure that trading rooms fully comply with the latest rules and regulations. 3GHz + dual-core or higher processor. Quad-core processor preferred. CME Direct has been developed using Microsoft .NET technology. The following software requirements are pre-requisites.